Freedom to say stupid things. Freedom of speech is the freedom to say even stupid things. It is also the freedom to criticise, be criticised and to counter criticise. We have no right on the other’s freedom to speak. We can criticise that speech, however, and be prepared for the consequences of reaction or response. Whatever it is, I always maintain that one should have the freedom to speak whatever, just be prepared for the bouquet of roses or the brickbats. I do detest, however, those who wish to limit or punish that freedom of expression, just because it sounds stupid and not according to what their ears, authorities, societies, nationalities, cultures, or religions, want to hear. You can argue that the speech is tasteless, racist, rude, I accept that. But once you start policing it, or even suggesting such things, I would condemn you. Now, let me say a thing about this obsession and emotional madness over the defeat of national hero Lee Chong Wei. He brought home a silver medal, not Gold, and this apparently broke many hearts. This also got a DAP assemblyman into trouble over his unflattering tweets about Lee. But the worst that can happen is that people can accuse you of being unpatriotic and anti-unity if you do not support Lee or say a bad word about him. As if he is God? Puhleez ya. I do not subscribe to such obsession and will not be persuaded to accept anyone’s hero if I do not have the mood to. Sorry. Malaysians must be clear about this. A sportswoman/man (artist/writer/whatever) can be a national hero but she or he may not be everyone’s hero. We must respect that. And so, just because you are emotional over what is said/done/spoken about your national hero; many others may not feel the same. For God’s sake, DO NOT FORCE other people to accept any/your ‘hero’ just because she/he is Malaysian. Some people have ‘global’ mindsets. They may like an individual for her/his talent/skills/creativity/expertise no matter where/which country/society/ethnic group/religion/political allegiance/social status/sexual preference she/he comes from. And yes, if you accept that freedom of speech can make people happy, it can also make people sad and hurt people’s feelings. It’s a choice we all can make without being forced by others. That’s freedom and that is absolute. # Posted by sloone on August 7, 2012 in ELECTIONS GENERAL. 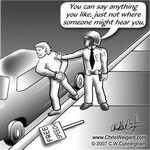 Policing of free speech is the heralding in of tyranny. Free speech must prevail ; as logic and reason are human arbiters. We only hear of people extolling Sports but we never hear of people who are not interested in that and the obsessive preoccupation with it being promoted as the compelling IN thing! It is as if you must be wildly Sports loving to be accepted into the “Norm”. Susan, who gets to draw the borders between the freedom to “hurt people’s feelings” and the freedom to respond in accordance to one’s hurt feelings? How would you ensure that all ensuing speech and “responses” remain within the confines of speech? The speaker get to draw her or his own borders. What if what she or he speaks was not intended to hurt people but people get hurt anyway because of their narrow mindedness, their lack of knowledge, lack of tolerance or inability to accept other people’s expression? True, Wits. If only they ask around, I am sure there are many who are not interested in sports and the likes but get dragged into the obsessive preoccupation anyway, for fear of being accused as unpatriotic? I’d rather be accused as so. The Tyranny of Sports Obsession thrives under BN/UMNO. Aren’t parents made to chauffeur their kids to school in the afternoon for Sports practices nowadays and for some time now? *^%@! Yes, Witso, it’s quite annoying. My niece has to stay back in school for sports, after spending many hours in classes already. It is not just the time but the money that has to be spent for uniforms, shoes and some idiotic fees. Hence PR people better take note about Sports Tyranny and stop it! I am afraid tyranny lies where power is. And PR or whatever coalition that comes to power can run from it. Only the degree of the tyranny may vary. Leaders should lead and lead well too, not lazily, authoritatively and conveniently pander to what they reckon form the majority with even more regressive outlooks and add to their backwardness and with great costs to others consequently as well. BN/UMNO have done this to serve their exploitative ends for 55 retarding years that landed us all in such a massive mess. Yes, I expect PR to be politically correct and politically pandering too but to a lesser degree. Frankly, I did not see how Lim Chong Eu deserve a State Funeral as it was him who brought Gerakan into the BN and promoted that AH Ah Koon, I suppose it is LGE’s PCness latitude at play. Often, it is not the law itself, but it is being used for selective persecutions! Like school regulations are set up for the students, not the teachers and headmaster! This is where the wrong is. Thanks Bersih, Anti-Lynas and Pengereng heros. Rural folks also able to see the reason . There have some hope in Bolehland..